McLife: What Was I Thinking? I am stubborn enough to be good at most things I try. I can learn new things well or at least complete them on a competent level (or so I thought). So, the idea of baking cakes from scratch seemed like no big deal. After all, our family has many reasons to celebrate this time of year, so a box cake just didn't seem appropriate. I went on the internet and found a cake and frosting recipe. All the ingredients were listed and the directions were written out in steps, just like I like them. I even read the comments and found that a box of pudding enhanced the receipe, so I added it. What the recipe did not list was important words to know in the bakers' vernacular. I drove to the store to gather ingredients, and should have known I was in over my head when I could not find the confectioner's sugar. I called a friend who was unavailable and then dialed my mother in law before I spotted the cheap brand with the words "Confectioner's Sugar." I hung up the phone quickly. I know my mother in law feels sorry for her son when I call with silly cooking questions. Anyway ... I should have known then that I was in over my head, but I'm not one to give up that easy. Of course, I was oblivious at this point to what was in store. To make it quick, I didn't have enough vegetable oil and had to borrow canola oil from the neighbor; my arms are sore because I thought that you had to mix while sifting (I really thought they were going to fall off); I forgot to put my special pudding ingredient in the mix; I thought I had burned the cakes, but discovered I had not cooked them long enough when I started to ice them, and they began falling apart; I realized that I spent more time covering up the cake particles in the icing than I did baking the cake; I had no idea fondant could be microwaved so I spent 10 minutes using force and kinetic energy trying to roll it (I finally got smart); and did I mention that my mixer started smoking as I was making the frosting? So, after 4 hours of baking and icing, and another 2 decorating with the kids the photo above is what we have. I don't know if they're edible, but they are presentable! No one has ever made me feel inferior, incapable or stupid. But can I say that God used something to do the job? I'm a little humbled. The conclusion to this story is: the next time my husband takes the kids out for the night, I will not spend my time doing something I know I don't like to do (cooking) in my least favorite room of the house (kitchen). Betty Crocker and Ducan Hines do a fabulous job, and they're cheaper and cause less stress. And there are some things, perhaps many things, that I'm just not good at or capable of! Well I think they look beautiful! Why are you already baking cakes for her birthday? I thought her birthday was somewhere around the 24th?? Cake was so yummy! Surprise on the bottom? WOW! Thanks for watching the girls tonight. K had a blast, as always. What a hoot! Though I thing this is one that you laugh at after, WAY after it's over! That is hilarious! Walmart makes pretty low priced cakes too. I just go with the store. It is worth the $14! They do look cute though. Way to go June! 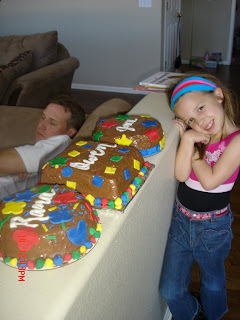 The cakes were great, all of them...especially the triple chocolate! The comfortable couch was good too though. You could have invited the whole state of Texas to help you eat those cakes! Betty Crocker -- you rock.